The 7th annual Peasantman™ Steel Distance Triathlon series takes place on Sunday August 18, 2019 at Indian Pines Park in Penn Yan, New York. Choose from the Full, Half, Intermediate, Sprint, Relay or Aquabike. What is a 'Steel Distance' Triathlon? 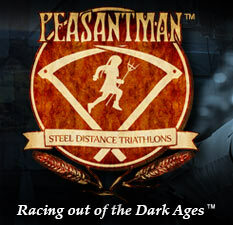 Peasantman is an officially sanctioned USA Triathlon event. Our own 'Steel Distances' are just slightly longer than traditional triathlon distances. But that's okay, because Peasants are stronger, and Peasants are out to prove their superiority. As illustrated below, you'll see that the extra distance is only on the bike course, but the swim and run haven't changed. Oh yeah... Peasants have an extra half hour to finish. No longer will you be closed out at the stroke of midnight. Peasants have until 12:30am! *Aqua Bike races available at Full and Half Distances. As a racer, your online registration will ask you to choose from a list of charities toward which to donate a portion of your race fee. It's not an added cost... it is simply a part of the race fee that will be redirected. The charities include the Humane Society of Yates County, Multiple Myeloma Research Foundation, Camp Good Days, Make-a-Wish Foundation, Wounded Warrior Project and the American Cancer Society. Feel free to raise money during the race for other charities that you may be affiliated with! We believe in giving back to the communities that support us. Here are two that benefit immediately from your support on race weekend. Milly's Pantry is a Penn Yan-based organization run entirely by volunteers distributing food locally to those in need. So bring at least one non-perishable food item for donation on race weekend. You can drop it off with the volunteers at the race packet pickup area. R Community Bikes is a grassroots 501(c)3 organization that collects and repairs used bicycles for distribution, free of charge, to Rochester, NY's most needy children and adults. If you have an old bike no longer in use (in any condition), please bring it on race weekend for donation. Just leave it with volunteers at the race packet pickup area or at the R Community Bikes booth at the expo. Peasantman Athlete Spotlight ~ Meet Zenman!